Mobile users can probably look forward to being automatically transferred from cellular to Wi-Fi networks in the near future, but going back and forth for the best possible performance is another matter. Software now in the works will use real-time knowledge about network conditions to make lightning-fast decisions about the best system for each user to be on at a given moment. The idea is that just because there's a Wi-Fi network nearby, doesn't necessarily mean your smartphone should start using it. If every subscriber near that hotspot got switched over to it, the Wi-Fi experience could suffer. It's already common for Wi-Fi networks in public places to get overloaded at busy times. Automatic handoffs from cellular to Wi-Fi, while convenient, won't make that situation any better. To prevent those overloads, networks will need more management smarts, said Daryl Schoolar, an analyst at Ovum. That's why both Ericsson and Nokia Siemens Networks announced technologies at CTIA Wireless last week for so-called real-time traffic steering. But the collection of standards that the industry is currently adopting for easy cell-to-Wi-Fi handoffs doesn't yet include this capability, so it may take a while for carriers to make it available. Mobile operators increasingly are giving their subscribers access to Wi-Fi, both by deploying hotspots and by partnering with other providers. This can give the carriers extra capacity, without paying for another spectrum license, in areas where many people gather and use mobile devices. For subscribers, it can mean faster network connections, depending on the cellular coverage in the area. Emerging technologies can authenticate users and put them on Wi-Fi automatically, eliminating the tasks of finding the network and logging in to it. However, that process is centered on the mobile device, which can lead to problems, said Sheila Burpee Duncan, head of Wi-Fi marketing at Ericsson. A phone or tablet may be set to automatically go onto Wi-Fi wherever it detects the signal, even though it doesn't know whether the Wi-Fi network is overloaded, she said. The two types of networks still are largely independent, a problem AT&T is looking to solve, said Kris Rinne, AT&T's senior vice president of network technologies. Her company has one of the largest Wi-Fi deployments of any mobile operator. "Today, they don't know anything about each other, and so you have to introduce that," Rinne said in an interview at CTIA. AT&T expects ANDSF (Access Network Discovery and Selection Function), a specification from the 3GPP, which oversees mobile standards from GSM through LTE, to help it solve the problem. However, ANDSF isn't designed to make decisions about network choice in real time, Ericsson's Duncan said. Instead, it's directed by overall policies that are designed to be changed at particular times, such as when a train is scheduled to arrive at a station. Constantly changing those policies on the fly, such as whenever the station happened to get crowded, would put too big a burden on the network, Duncan said. Real-time traffic steering will complement ANDSF and other standards such as Hotspot 2.0, she said. 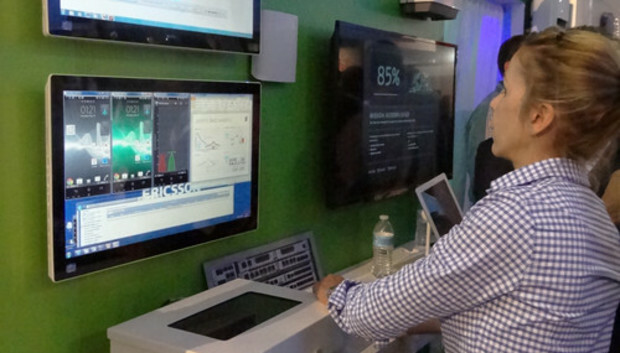 Ericsson's traffic-steering feature will be an enhancement to the company's network management software and will arrive by the first quarter of next year. It won't require any special software on handsets, though it will only work with devices that can use EAP (Extensible Authentication Protocol), according to Duncan. Virtually all smartphones have EAP, she said. The catch is that, for now anyway, carriers will have to use both cellular and Wi-Fi gear from Ericsson to get the feature, Duncan said. The core of the network can be from another vendor, she said. If a carrier uses two different suppliers for its network, as many do, then requiring special gear may hold up adoption of real-time traffic steering, Ovum's Schoolar said. "You're going to have a very different experience throughout your Wi-Fi footprint. That is kind of a challenge with it in terms of selling it to mobile operators," Schoolar said. At CTIA, NSN also announced real-time traffic steering, which it said carriers will be able to implement as an overlay on top of whatever equipment they have in their cellular, Wi-Fi and core networks. The new capability, part of the company's Smart Wi-Fi portfolio, will be available in the third quarter, according to NSN.